A national bestseller that has changed the way readers view the ecology of eating, this revolutionary book by award winner Michael Pollan asks the seemingly simple question: What should we have for dinner? Tracing from source to table each of the food chains that sustain us - whether industrial or organic, alternative or processed - he develops a portrait of the American way of eating. The result is a sweeping, surprising exploration of the hungers that have shaped our evolution, and of the profound implications our food choices have for the health of our species and the future of our planet. Michael Pollan’s last book, The Omnivore’s Dilemma, launched a national conversation about the American way of eating; now In Defense of Food shows us how to change it, one meal at a time. Pollan proposes a new answer to the question of what we should eat that comes down to seven simple but liberating words: Eat food. Not too much. Mostly plants. Author Barbara Kingsolver and her family abandoned the industrial-food pipeline to live a rural life - vowing that, for one year, theyd only buy food raised in their own neighborhood, grow it themselves, or learn to live without it. Part memoir, part journalistic investigation, Animal, Vegetable, Miracle is an enthralling narrative that will open your eyes in a hundred new ways to an old truth: You are what you eat. Thousands of Simple Food Swaps that Can Save You 10, 20, 30 Pounds - or More! Eat what you want, when you want - and watch the pounds disappear! How we choose which foods to eat is growing more complicated by the day, and the straightforward, practical approach of What to Eat has been praised as welcome relief. As Nestle takes us through each supermarket section - produce, dairy, meat, fish - she explains the issues, cutting through foodie jargon and complicated nutrition labels, and debunking the misleading health claims made by big food companies. With Nestle as our guide, we are shown how to make wise food choices - and are inspired to eat sensibly and nutritiously. 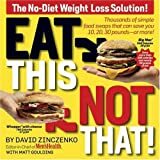 Now in paperback, What to Eat is already a classic - "the perfect guidebook to help navigate through the confusion of which foods are good for us" (USA Today). Today's favorite kitchen companion - revised and better than ever. Mark Bittman's award-winning How to Cook Everything has helped countless home cooks discover the rewards of simple cooking. Now the ultimate cookbook has been revised and expanded (almost half the material is new), making it absolutely indispensable for anyone who cooks - or wants to. With Bittman's straightforward instructions and advice, you'll make crowd-pleasing food using fresh, natural ingredients; simple techniques; and basic equipment. Even better, you'll discover how to relax and enjoy yourself in the kitchen as you prepare delicious meals for every occasion.